January 2009 | Fashion and the public, both fickle, love the new, so it is curious that a chair designed some 250 years ago has suddenly become the “it” accessory in many trendsetting houses. Furnishings do nothave publicists or agents, but they do have shelter magazines. If you read any of them, chances are you have seen the so-called Frances Elkins or loop chair many times in the last few years.1 Venerable decorators such as Albert Hadley and Richard Keith Langham have featured it, and so have younger stars such as Celerie Kemble (see Fig. 1) and Miles Redd. James Shearron, of the architecture firm Bories and Shearron, has become the chair’s unofficial biographer, eager to trace it back to its birth in the last third of the eighteenth centuryand in so doing dispel the myth that it originated with the 1930s decorator Frances Elkins. Shearron says he has been obsessed with the chair ever since he photocopied a page showing it in Percy Macquoid and Ralph Edwards’s Dictionary of English Furniture, from the Middle Ages to the Late Georgian Period in the Lake Forest Library in Illinois sometime in the 1970s. The book followed Macquoid’s pioneering four-volume A History of English Furniture, which appeared from 1904 to 1908. In order to include so many images in his History, Macquoid had cultivated an extensive network of fellow collectors, among them “Frank Green, Esq.,” who was identified as the owner ofthe “Painted Beechwood Chairs” shown in the fourth volume (see Fig. 4). Macquoid dated them to “about 1768, for the dipped seat was introduced about that time” and judged them “more ingenious than beautiful.”2 This somewhat unflattering description is the first reference in print to the chairs under discussion here. Green (c. 1861–1954), a wealthy industrialist, was an interesting figure who between 1897 and 1930 restored the Treasurer’s House in York, England, furnishing its rooms in a variety of historical styles before donating it to the National Trust.3 It would be fascinating to find out how the chairs came into his possession, but he did not have them for long. Sometime before 1924 they ended up in the collection of Edward Burgess Hudson, the founder of Country Life, where Macquoid was a columnist. Two can be seen in a photograph from the Country Life archives of Hudson’s drawing room at 15 Queen Anne’s Gate, London, taken in the early 1920s (Fig. 2). Without sales figures, of course, it is hard to quantify the popularity of Macquoid and Edwards’s books. Even so, something of the Dictionary’s influence can be gleaned from the fact that revised editions were issued in 1954 and, as the Shorter Dictionary of English Furniture, in 1964. Even Macquoid’s History made additional appearances, reprinted in 1972, 1987, and 1988. The loop chair appears in all versions. These are the kinds of books that dealers, collectors, architects, and decorators covet. One influential decorator who must have had the first edition of the Dictionary was Elkins. From the 1930s until her death in 1953, she created sumptuous interiors from California to New York. She is especially remembered for her collaborations with her erudite brother, the architect David Adler (1882–1949), in Chicago and its suburbs. Her signature style was a mix of eighteenth-century antiques with the work of contemporary designers such as Jean-Michel Frank (1815–1941) and Alberto Giacometti (1901–1966). Elkins also designed furniture herself and had antique forms copied by her team of craftsmen in California.6 Her version of the loop chair appeared in two projects from the early 1930s—on the “living porch” of the residence of Evelyn Marshall Field (1888–1979) in Muttontown, New York,7 and in the Lake Forest living room of Mr. and Mrs. Leslie Wheeler (Fig. 5). Shearron, who grew up in Lake Forest and loves Elkins’s work, has combed through periodicals in search of it. Although there are literally dozens of loop chairs out there listed as “vintage” Frances Elkins, he thinks the two sets of four made for Field and Wheeler are probably the only ones she had made. “I’ve seen every photograph of her work and they don’t show up in any other projects,” he reports. 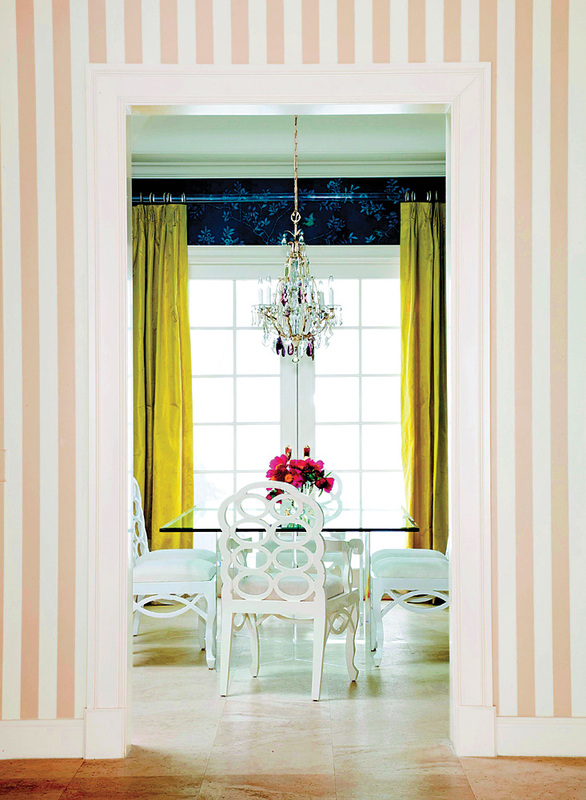 Insider knowledge went mainstream when Stephen Salny’s extremely popular monograph on Elkins’s interiors reintroduced her to a whole new generation in 2005. The recent explosion of popularity of the loop chair seems to stem from that moment. “There were a lot of copies of the chair around,” Shearron says, “and, suddenly, antiques dealers were all attributing them to Elkins.” In addition to vintage versions, several manufacturers began making new copies (see Fig. 6). In the meantime, the original chairs continued on an odyssey of their own. Although the later editions of the Dictionary still credit Hudson, who died in 1936, as the owner, his set had actually been sold in the mid-1930s to Ronald and Nancy Tree (later Lancaster), who had acquired Ditch­ley Park, a grand early eighteenth-century house in Oxfordshire.9 Two of the chairs­—an armchair and a side chair respectively—can be seen in watercolors of the writing room and yellow bedroom at Ditchley Park by the Russian artist Alexandre Sérébriakoff (see Fig. 3).10 The Trees’ London address was 28 Queen Anne’s Gate, just a few doors away from Hudson at number 15, so they may well have acquired the set from him or his estate. 1 See, for example, House Beautiful, April 2008, p. 194, and September 2008, p. 58; Elle Décor, December 2008, p. 133; and Domino, June–July 2006, cover, and June–July 2008, p. 114. 2 Percy Macquoid, A History of English Furniture, including The Age of Oak, The Age of Walnut, The Age of Mahogany, The Age of Satinwood (1904–1908; reprint Bracken, London, 1988), pp. 383–384. 4 Percy Macquoid and Ralph Edwards, Dictionary of English Furniture, from the Middle Ages to the Late Georgian Period (Country Life, London, and Charles Scribner’s Sons, New York, 1924–1927), vol. 1, p. 245, Fig. 118. 6 Stephen M. Salny, Frances Elkins: Interior Design (W. W. Norton, New York, 2005), p. 14. 7 A photograph of Evelyn Marshall Field’s living porch originally published in Vogue in 1936 is reproduced ibid., p.144. 8 Richard Pratt, David Adler (M. Evans, New York, 1970), p. 187, Pl. 150. 9 According to Martin Wood, Nancy Lancaster: English Country House Style (Frances Lincoln, London, 2005), p, 189, n. 30, the Trees acquired five side chairs and one armchair from Hudson. 10 Ibid., pp. 60, 74–77. 11 The Property from the Collection of Mrs. Marietta Peabody Tree and the Late Ronald Tree, Sotheby Parke Bernet, New York, October 8 and 9, 1976, Lot 312. The set consisted of one arm- and five side chairs. 12 Mallett had a sixth side chair made to match the set. 13 Lanto Synge, Mallet’s Great English Furniture (Barrie and Jenkins, London, 1991), p. 69, Fig. 67.